This HiRISE image ( PSP_002671_1790 ) is centered on a small cone on the side of one of Mars' giant shield volcanoes. The cone shows some layers of hard rock but most of it is made of relatively soft material. This appears to be an example of a "cinder" cone composed of pieces of lava thrown into the air during a small volcanic eruption. Typically, such eruptions produce fountains of molten lava. Most of the lava would have cooled in this fountain, producing a loose pile of lava rocks. However, it appears that some pulses of the eruption allowed the lava to land without cooling much. These pieces were hot enough to weld together to make the hard layers we see today. The cone is 700 x 1100 m (2300 x 3600 feet) in size, similar to many cinder cones on Earth. 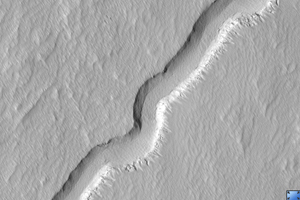 In other parts of the image, we see channels carved by lava. It is sometimes difficult to tell if a channel was formed by flowing water or lava; in this case, it is possible to see that lava flows feed out of these channels.